[SOLVED] Why is the RESET pin set up like this in this Z80 schematic? Which after a lot of datasheet reading I mostly understand. The main thing I don't understand, however, is what's going on with the RESET pin. First of all, I understand that the RESET pin is active-low. In this case, why is it pulled high to +5V? Surely I wouldn't want the CPU to reset. I assume the answer to this part is something to do with resetting on boot. My main question is why there's a capacitor from RESET to (what seems to be) ground. Is that even ground? If so, why is there a capacitor before it? If not, what is it, and what does it do? The Reset pin is Active low, so has to be pulled low to reset the processor. The capacitor connected to the reset pin is also connected to Gnd (the schematic uses a wrong symbol), and along with the pullup resistor forms an RC network that holds the processor in reset for a time after VCC first rises. 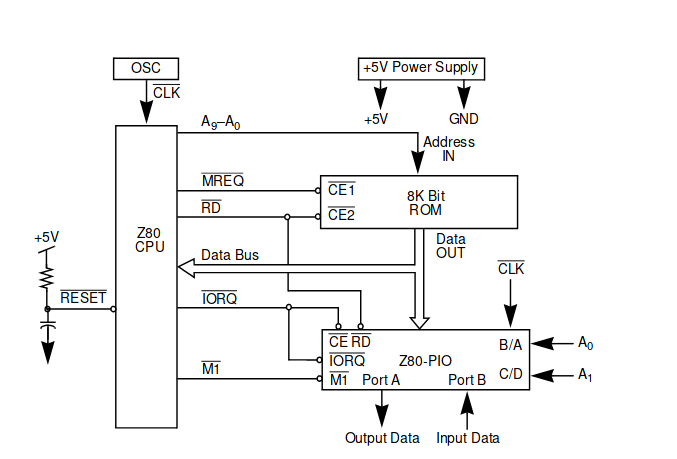 The RC values are defined to hold the processor in reset long enough to let the supply stabilize. It can also provide a physical reset button to reset/restart the processor. 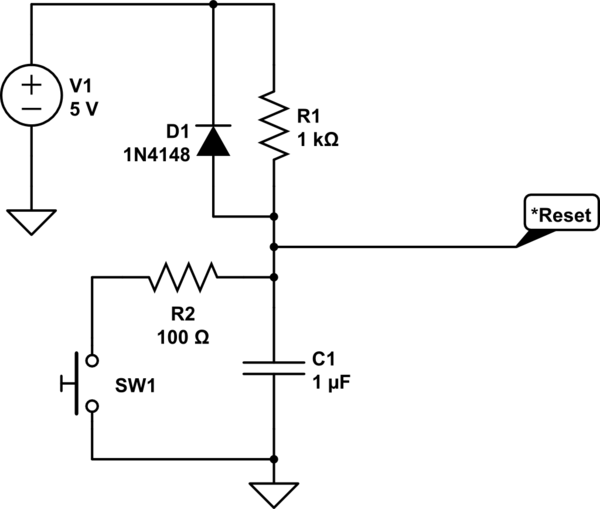 Often there is also a diode in parallel with R1, to discharge C1 when VCC is removed. Also, for proper operation this requires that the input be a Schmitt trigger, in order to allow reliable operation. @WhatRoughBeast Some circuits did use a Schmidt trigger some didn't. Many circuits didn't even have C1. The *Reset input was the same as the *NMI and *INT pins and was level sensitive, so as VCC rose it eventually released the *Reset. But I do agree the better schematics did do it that way. As you have correctly stated, RESET is active low. On power up C is discharged, the reset is held low which forces the chip to hold off initialising while the power stabilises. After a time roughly equal to R x C (s) the capacitor voltage has charged up through R enough to release the RESET and allow the controller to run. By this time the power should be stable. [SOLVED] What exactly does the Z80 PIO do? [SOLVED] Does pin A15 on a Z80 tell if the CPU is addressing ROM or RAM? [SOLVED] How was the Zero Flag implemented on Z80 ALU? [SOLVED] Can I connect TTL gates directly to the address bus of a Z80 CPU?